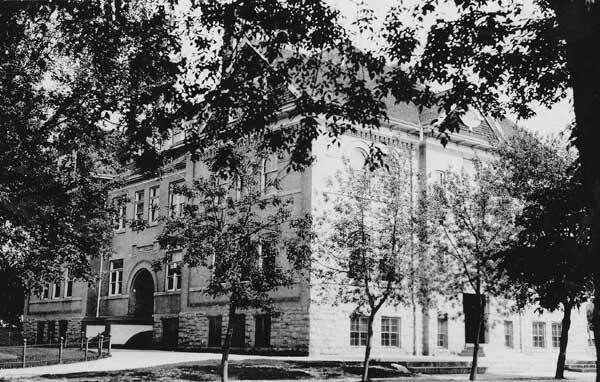 Built in 1904 by the Brandon Construction Company, under supervisor T. M. Harrington, on the south side of Lorne Avenue between 14th and 15th streets in Brandon, Park School was opened to the public at a ceremony on Arbor Day, 4 May 1905. It replaced the former West Ward School at this site. 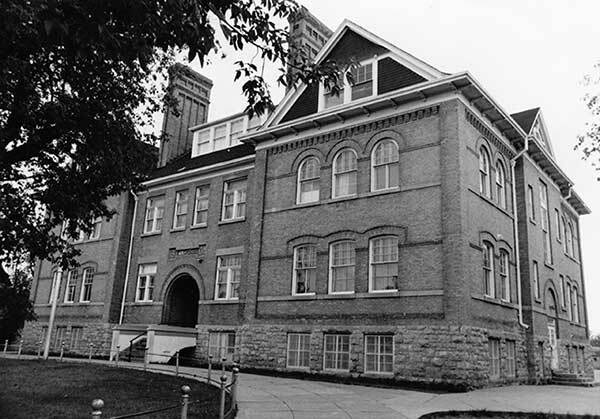 Designed by Brandon architect W. A. Elliott, the school’s interior was decorated with walls of mahogany and western pine with floors of British Columbia fir. 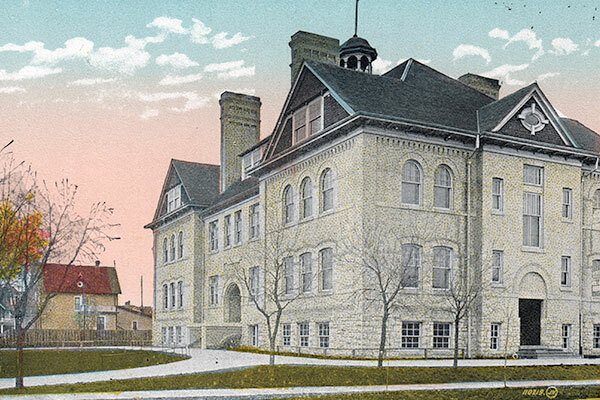 The two-storey brick and stone building had ten classrooms, principal’s office, reception room, a teachers’ room, and an assembly hall on the second floor. The cost was around $38,000. 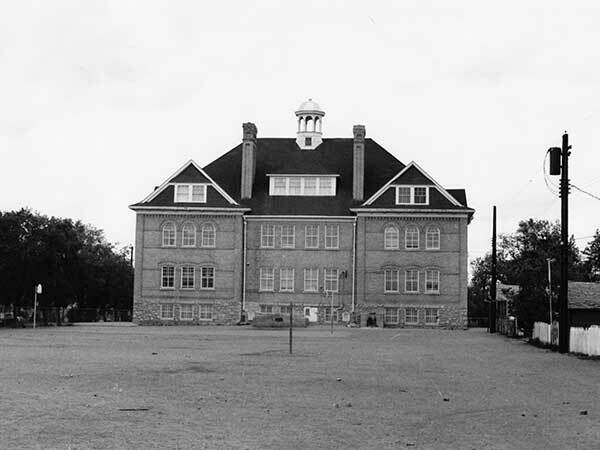 In the early 1970s, the Brandon School Division declared the building redundant and, in November 1975, its remaining students transferred to the newly constructed Betty Gibson School, built on the site of the demolished Alexandra School. 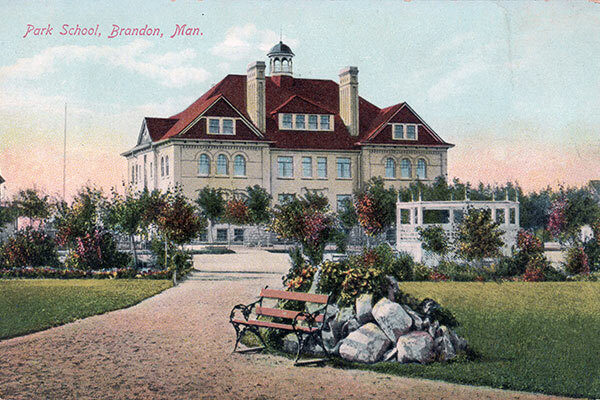 The Park School building was sold to Brandon University for $1, for use as office space and a day-care centre. However, in late 1977, when costs of renovations were found to be excessive, the university returned ownership to the Division. No other offers to purchase the old school building were received and it was demolished in September 1978. GR8461, A0233, C131-3, page 135. Source: Archives of Manitoba, Architectural Survey - Brandon - Park 3. Source: Archives of Manitoba, Architectural Survey - Brandon - Park 4. “New school to be built,” Brandon Daily Sun, 14 October 1903, page 1. “West Ward School contract is let,” Brandon Daily Sun, 27 April 1904, page 1. “West Ward School,” Brandon Daily Sun, 29 April 1904, page 1. “School Board,” Brandon Daily Sun, 9 November 1904, page 2. “Tenders [West Ward School assembly hall],” Brandon Daily Sun, 4 February 1905, page 4. “School Board,” Brandon Daily Sun, 8 February 1905, page 8. “West Ward School,” Brandon Daily Sun, 10 February 1905, page 1. “West Ward School,” Brandon Daily Sun, 21 February 1905, page 4. “Opening of the Park School,” Brandon Daily Sun, 2 May 1905, page 1. “The Park School opened Friday,” Brandon Daily Sun, 6 May 1905, page 1. “New teachers appointed,” Brandon Daily Sun, 6 September 1906, page 1. Henderson’s Brandon Directories, Peel’s Prairie Provinces, University of Alberta Libraries. “Around town,” Brandon Sun, 1 September 1927, page 9. “School population explosion kept early school board busy,” Brandon Daily Sun, 28 August 1970, page 8. “Wreckers demolish Park School,” Brandon Sun, 1 September 1978, page 1. “Thirty years ago,” Brandon Sun, 13 November 2005, page 6. “Park School,” Item No. 1-2002.3.1DA16(1), Stuckey Collection, S. J. McKee Archives, Brandon University. We thank Tom Mitchell, Greg Sigurdson, Catherine Harley, Geraldine Sookorukoff, and James Rodgers for providing additional information used here.